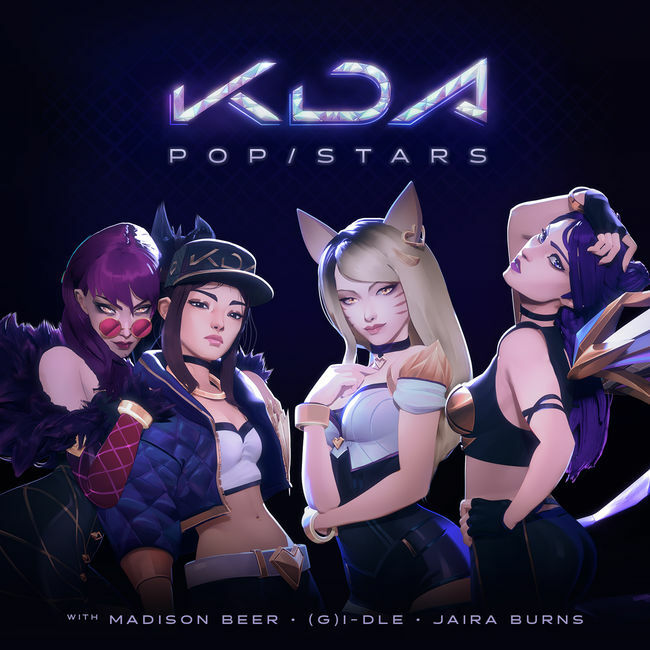 The music video “POP/STARS” from project group K/DA and featuring the voices of Madison Beer, (G)I-DLE, and Jaira Burns surpassed the 100 million view mark on YouTube. The music video “POP/STARS” has officially reached the 100 million view mark on YouTube this week. Developed by Riot Games, the company behind League of Legends, the track featured the voices of K/DA, Madison Beer, (G)I-DLE, and Jaira Burns and graphics that mirror the video game. Notably, this song reached the milestone in just 32 days, illustrating its huge popularity. In particular, “POP/STARS” reached 10 million and 50 million views in just three and ten days, respectively. In regards to K-pop, the music video surpassed 100 million views in the shortest time following Psy’s “Gentleman,” BTS’ “Idol,” “Fake Love,” and “DNA,” as well as “Du-Ddu-Ddu” by BLACKPINK. Further, the Riot Games unveiled the song for the first time at the opening ceremony of the 2018 League of Legend World Championship at Incheon Munhak Main Stadium on November 3. On the same day, the song rose to the top spot on iTunes K-pop chart and No.40 on Melon Music. K/DA is a group formed by Kasa, Ari, Evelyn and Akali, the popular characters of the League of Legend. As K/DA the four have transformed into pop star idols, drawing the attention of fans globally.